It may be 'supermini' in size but there is nothing miniature about its elegance, power, and performance! 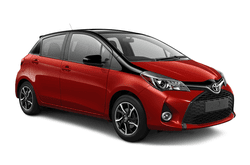 At times the Yaris feels eerily like a limousine as it glides smoothly away under electric power and still provides you with the comfort you need and the style you want. It is top of the list when it comes to performic and power and as a hybrid you can feel confident knowing you are making a positive impact on the environment and the world around you. It has all the features you want and need, wrapped up in the strong Toyota legacy. So check out the Toyota Yaris Hybrid today and see what luxury style and quality performance can do to elevate your transportation needs.